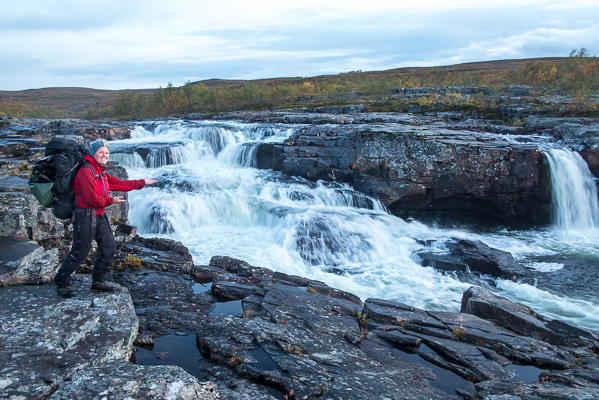 Stabbursdalen National Park is one of Norway’s most remote and inaccessible National Parks. The diverse landscape varies from mountain dessert like areas to lush birch forests, vast plateaus to narrow canyon like valleys. 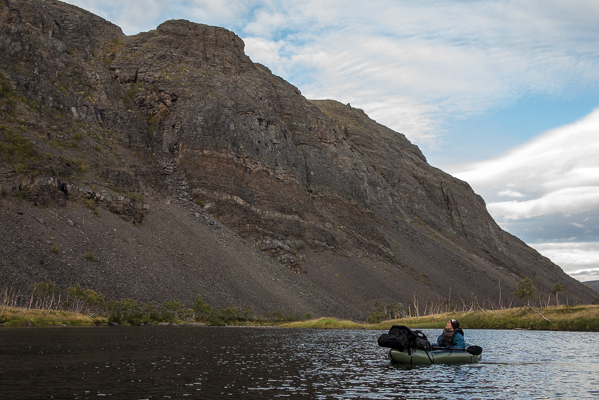 On this expedition tour, we travel with Packrafts through the entire park from southwest to northeast along the Stabbursdalen River. 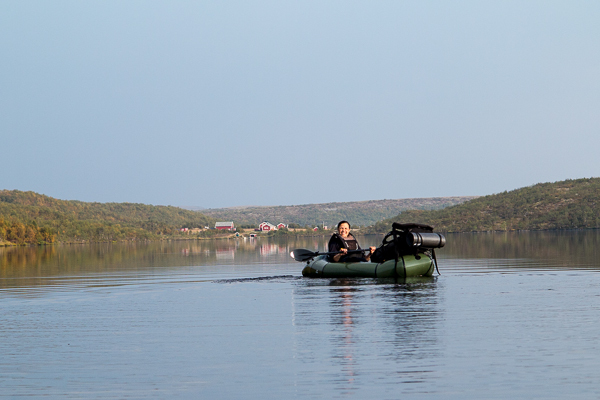 Packrafts are stable, lightweight and easy to maneuver even for beginners. 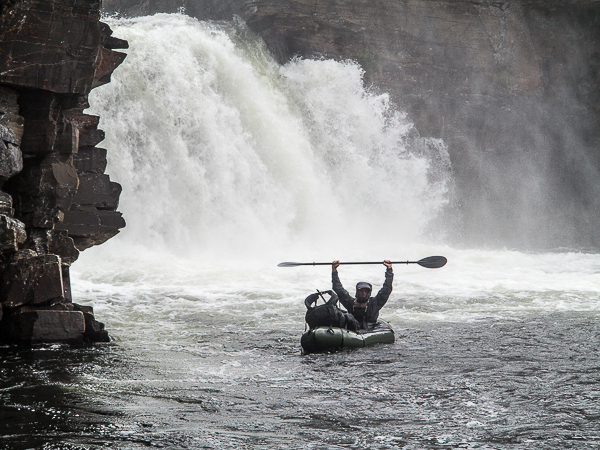 The river offers a great variety of challenges from calm lakes to unnavigable but beautiful waterfalls. The highlights of this trip are collecting foods from the land, the landscape and the variety of the river. Other trips with packrafts on request. 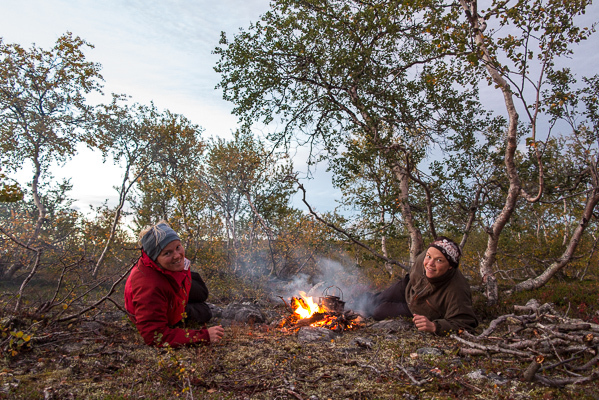 In the second half of August the infamous Finnmark mosquitoes are gone, leaving the land open and free for people to enjoy the remainder of the Arctic summer in peace. 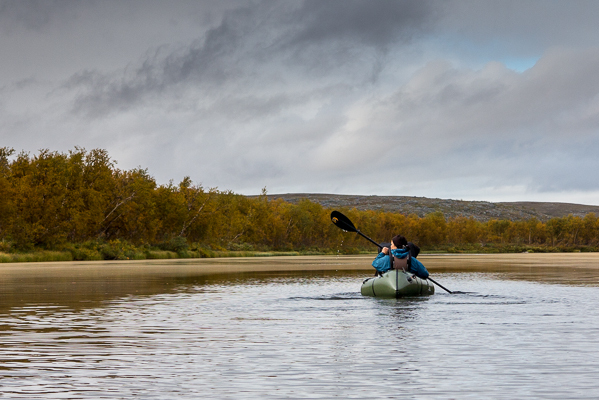 This is the richest time of year in the Arctic: Berries are ripe; mushrooms are ready to be picked and Trout, Actic char and other freshwater fish are plentiful in the thousands of lakes and rivers scattered accross the tundra. 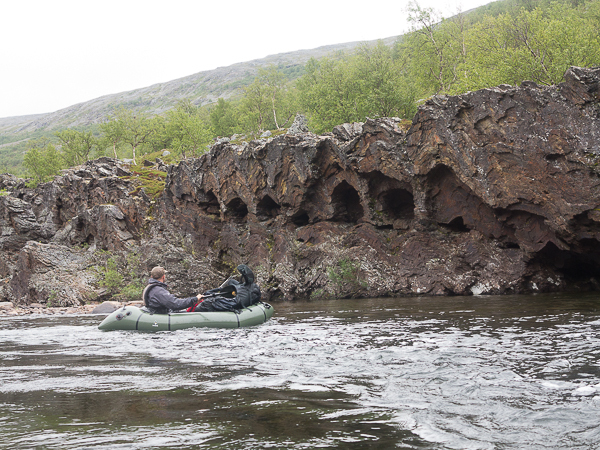 As we travel down the Stabursdalen River from inland Finnmark to the Arctic coast in Porsanger Fjord you will witness a beautiful landscape varying from vast mountain plateaus to narrow valleys. You will see snow clad mountain peaks and green hillsides. 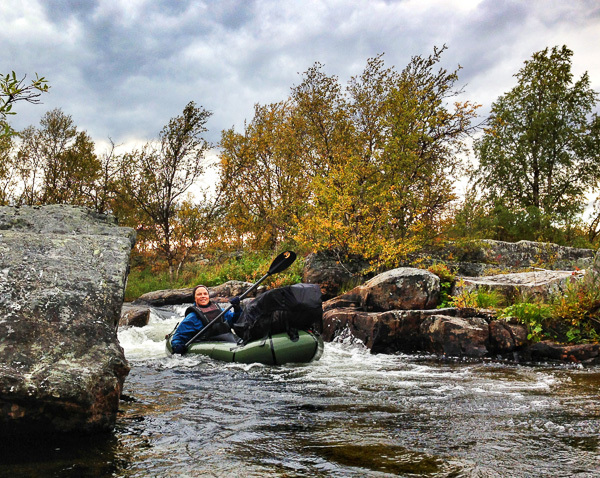 The river offers a variety of challenges from calm lakes to white water rapids and unnavigable waterfalls. It starts out nice, calm and quiet - giving you time to get comfortable with your boat and the maneuvering. As we travel further and further downstream the obstacles get ever more challenging, giving you a nice progression in skills and thrills. But don't worry! Our packrafts are also easy to handle on land and taking them out of the water to walk around an obstacle is no hassel at all. Along the way there will also be time for fishing, small excursions away from the river, picking berries and other edible plants, taking a bath or any other activities that you find interesting. You can find iconic animals like Golden eagles, Lynx, Wolverines, Brown bears, Moose and in some years even the rare and elusive Snow owl. You can also find species like the endangered Lesser White-fronted goose nesting here. 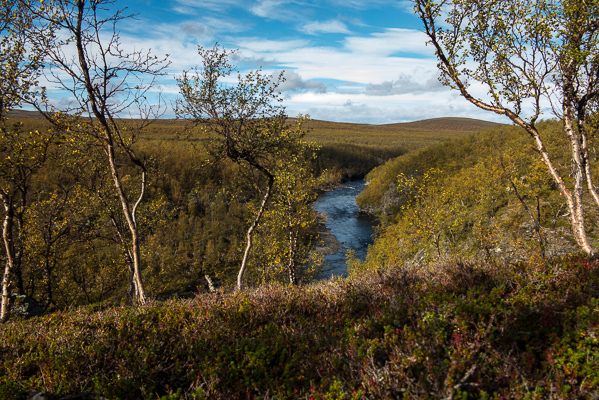 Moreover, the Stabbusdalen National Park is not only wild and untouched nature, it is also the summer pasture and calving grounds for Sámi reindeer herds. The small geological formations in the park are mostly from the last ice age, but the history of the 1000m high mountains dates back more than 600 million years. 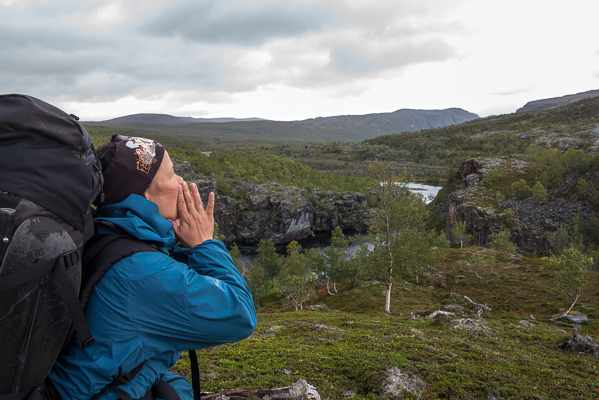 There are many vulnerable species, both plants and animals, in the Stabbursdalen National Park and we ephasize making this a very low impact expedition. 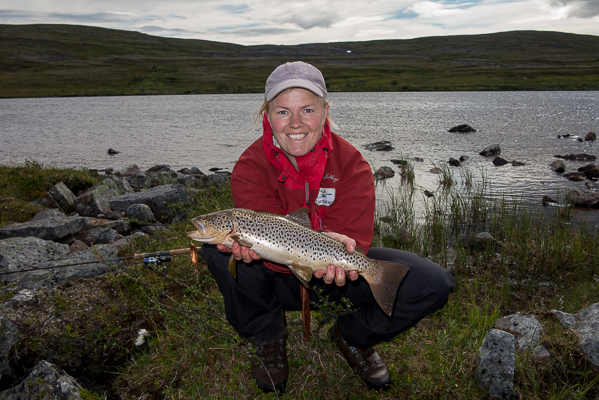 Your guides on this trip are verry experienced and well educated outdoor guides. They are also certified Swiftwater Rescue Technicians. Day 1 Arrival in Alta, supper, briefing about the details of the trip and checking your personal equipment. Packing everything ready for the expedition. Lodging at guesthouse/cabin. Day 2 Last minute purchasing and a short drive to where the Expedition starts. 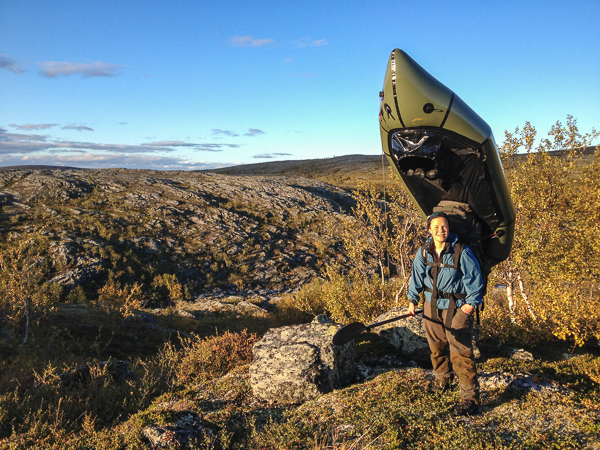 Day 3 - 8 Packrafting from the Finnmark Plateau to Stabbursneset by the Porsanger Fjord. Camping in tents. Day 8 Arrival at Stabbursnes. Day 9 Breakfast and journey home. Arrival in Alta. Your guide will meet you at Alta Airport and take you to a local guesthouse/cabin where you will stay the first night. You will be served dinner and your guide will go through the program for the trip and other details for the expedition. 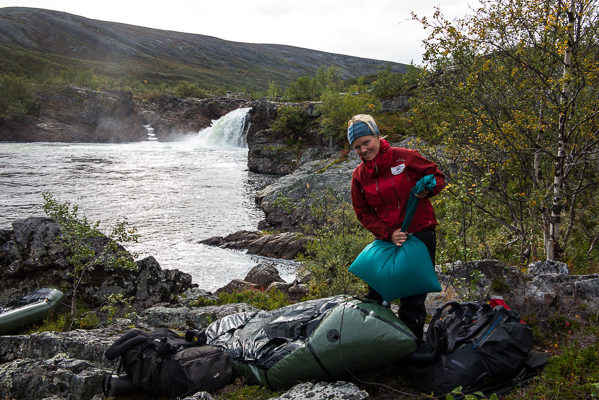 Your guide will also go through your personal outdoor equipment to make sure everybody have brought everything they need for the trip and that the equipment meets the standards that the Arctic environment requires. Finally everything is packed ready for the expedition. After breakfast there will be time for some last minute shopping before we travel to the mountains where the trip starts. We start of softly on the first day with packrafting and hiking only approximately 4 kilometers to the Jotka Mountain Cabin. Here you will be served dinner and stay for the night. In the afternoon you will be shown how to put up your tent and how to use some of the equipment that you will be using on the trip. There will also be time to make your final personal preparations and adjustments before the expedition starts. Your guide will also go through some safety routines with you. 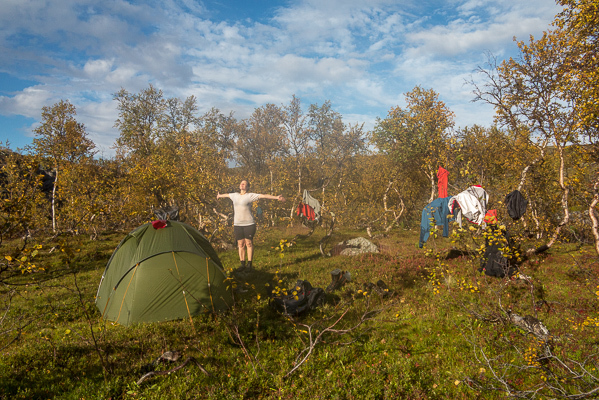 We start our expedition by hiking about 9 kilometers from Jotka ountain cabin to Upper Stabbursdalen lake. On the shores of Upper Stabbursdalen lake we reinflate our Packrafts and padle accross the Upper and Lower Stabbursdalen lakes before we start on the river. This gives you plenty of time to familiarize yourself with the convenient, light weight, stable and easily manouverable Pack rafts. On our way down the river we will be in and out of the river several times, giving you a nice combination of "resting" on the river and streaching your legs by walking past the rougher sections of the river. We will be camping in tents along the river, but please feel free to sleep next to the camp fire under the open sky if you like. The river is rich in brown trout so if you would like to catch your own food you are welcome to (fishing license can be purchased before leaving Jotka mountain cabin. Not included in the tour price). We arrive at the coast and Stabbursneset in the Porsanger Fjord. We check in at Stabbursdalen Lodge where warm showers, soft beds and our last dinner together awaits us. - Items marked with * can be provided by Turgleder for free on request. Information about equipment you need must be conveyed to Turgleder minimum 1 week before arrival. Items with an additional cost are noted with the price. - If you choose to bring your own sleeping bag, this needs to have a minimum comfort temperature >/= 0˚ Celsius. - We do also recommend that you bring a camera with extra memory cards and battery. Remember to brin waterproof casing or waterproof bags for your camera. - You are of course welcome to bring your own Packraft if you prefer that. Equipment that you do not need on the expedition can be transported from Alta to Stabbursnes for you. This trip has no sceduled departures, and are only available on request in July, August and September. All meals from dinner on day 1 to breakfast on day 9, lodging in Alta and Stabbursnes and some equipment (see eqiupment list). · Travel to Alta and from Stabbursnes.